The Everlast Hydrostrike is a hanging heavy bag with a unique water filled core. This core gives your strikes a fluid, lifelike feel. The water core also is very effective at absorbing and eliminating reverberations from punches and kicks, which help prevents wear and tear on your knuckles and joints. The water is contained in a radio frequency welded urethane bladder that will prevent leaks and bulges along the seams. This bag also includes a heavy duty welded chain and swivel so all you need to do is fill it and hang it. Another added advantage of this water filled bag is that you can add or remove water to adjust the weight of the bag to increase or decrease resistance and sway. This is a unique heavy bag that will give you a great workout! 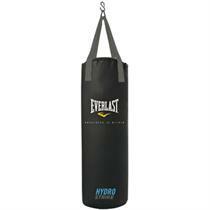 Email your friend about the Everlast Hydrostrike Water Foam Heavy Bag. Ask a question about the Everlast Hydrostrike Water Foam Heavy Bag.